Garage Baby is how the seller of today’s Nice Price or Crack Pipe MR2 Spyder affectionately describes his car. We’ll just have to see if its price means that this baby’s got backing. Only the good die young, or so we’ve been told in musical manner by Billy Joel. I don’t really know which song as I’m not all that much a fan of the Piano Man. Still, I’d like to appropriate and tweak those lyrics for our purposes and note that only the good sell fast. Yesterday’s 1987 BMW 325is seemed pretty good, as did its $6,000 price. At least it took home a solid 58-percent Nice Price win, which was pretty good. It also apparently sold, as the ad was removed by the seller just as we were getting underway. Perhaps we’ll have more time to appreciate today’s 2003 Toyota MR2 Spyder, a model that I think seems to go under-appreciated. Toyota’s MR2 line encompassed three distinct editions. They got progressively more capable and aggressive over the course of the first two, and then, strangely, dialed everything back with the third. The MR2 Spyder was also the first in the line to eschew pop-up headlamps for big bug-eyed fixed units. As we all know, that’s a reproach that’s damn-near unforgivable. In fact, the third generation, or W30, edition of the MR2 seems to have a lot of compromising aspects when compared to its predecessors. Not only does it offer less power but it’s also smaller in every dimension save for wheelbase, and lacks much in the way of luggage space and elbow room. There’s still something crazily appealing about a mid-engine convertible and when you find a car that’s described by its seller as a garage baby, well, you just have to check it out. That’s just how the seller of this MR2 Spyder positions his car. Now, we typically anoint such a meticulously maintained machine as a ‘Garage Queen,’ but considering how small the Spyder is I think ‘Baby’ is wholly more appropriate a sobriquet here. This Absolutely Red over black cloth Spyder sports 104,000 miles on the clock, a number that the seller positions as ‘LOW MILES!’ That’s about 7K a year which I guess in the overall scheme of things is, in fact under the average, so I’ll give him that. The car rocks factory alloys, and to be honest there don’t seem to mods of any sort here. Even the nose deems free of drill holes for a number plate. Paint is clean and holds a shine and those big bug eye headlamp covers show only a trace of clouding. Overall it’s what you’d want in the little roadster. The extremely intimate interior appears likewise ready for action. It’s extremely plasticky in here, but at least it’s all Toyota quality plastics so they should keep their shape and stem off squeaks for some time to come. We don’t get to see the convertible top in its raised position but seeing the presentation of the rest of the car it would be unexpected if it wasn’t in serviceable shape. The only real red flag here is when we get to the engine compartment. There, the 138-horse, 1798-cc VVT-i four and its companion five-speed manual gearbox sit amidst a structure that seems to have had something sprayed all over it. What was that, coolant? Motor oil, maybe? It’s hard to say from the pic but at the very least the compartment could stand a good wipe down and it stands in stark contrast to the rest of the car’s condition. You might also note here that, while the previous generations had a trunk behind the engine, the much smaller Spyder doesn’t. Add to that the turned around 1ZZ-FED, with its rear-facing exhaust and you’ll find that you couldn’t even keep a folded Kleenex back there if you wanted to. That’s okay because these cars were meant to drive not to carry your goods to market. This one is claimed by its seller to be ‘[a] blast to drive,’ handling ‘like a dream,’ and offering a ‘surprisingly smooth ride.’ Those are impressive proficiencies, and adding them up with the car’s overall nice shape and, I guess, low miles, makes this an appealing Spyder. How appealing? Well, the seller is hoping that its allure is worth at least $5,750. We’ll need to decide if he’s right. 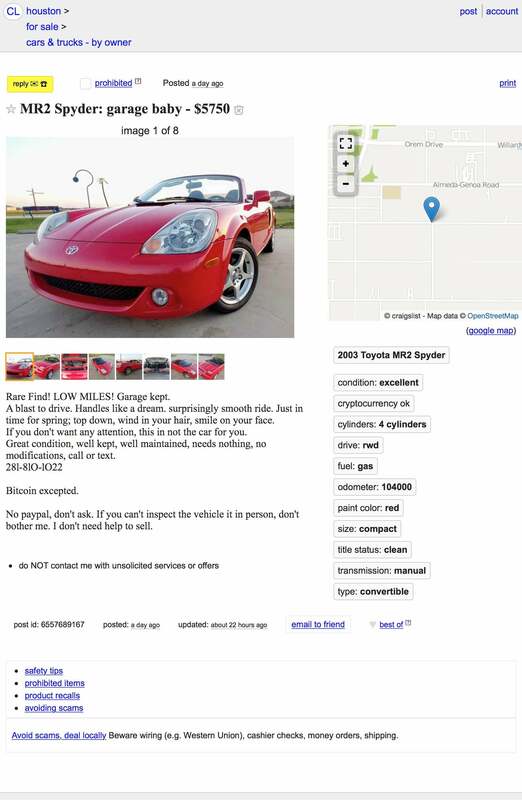 What do you think, is this MR2 Spyder worth that $5,750 asking? Or, would this Garage Baby need to grow up real fast before it could claim that much cash? H/T to lastcastlenutz for the hookup! For $11,500, Could This Modded 1993 Toyota MR2 Turbo Be Your New Obsession? 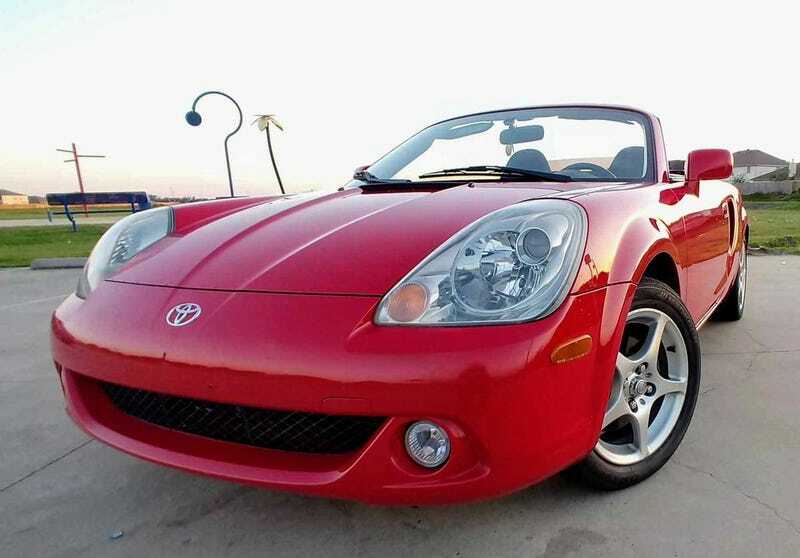 At $3,700, Could This 2001 Toyota MR2 Spyder Be Your Rough Rider?